Elios (a.k.a. Entertainment LIgthing Open source Software) is an entertainment lighting remote using ArtNet protocol (DMX over Ethernet). 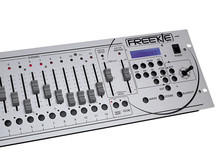 JB Systems DMX Creator 128 comes with the full version of DMX Creator. ENTTEC has updated its lighting control plug-in DMXIS to version 1.1.1 (Build 1612). DMi D&M Installation has announced it is now shipping its new Escient Zone DIN rail lighting system to appointed dealers and installers. ENTTEC has updated its Lighting Control Plug-in, DMXIS, to v1.0.4. The companies describe it as "a revolutionary new lighting control system for artists and performers". Elation Professional introduced its new RMD-1220 12-channel rack-mount dimmer.